The make, style and colour of a vehicle can be an important part of personalising a funeral service. Here in Geelong, Tuckers Funeral & Bereavement Service continuously maintains some of the finest vintage hearses and has an impressive range of vehicles to suit your requirements. This hearse was originally built in 1926. Previously used by Odges & Son Funeral Directors in Castlemaine, the hearse was purchased by Tuckers in 1993 from a private collector in Harcourt, Victoria. 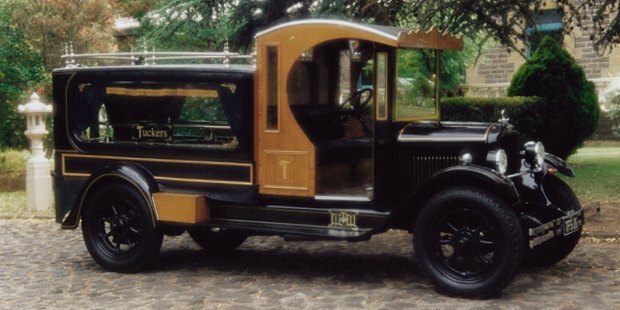 Hundreds of hours were spent on the restoration of this vehicle, as it was originally manufactured as a horse-drawn hearse. It has a four cylinder OH/V motor with a manual transmission. This Ford Galaxy hearse was purchased by our Geelong funeral home in 2010. The name ‘Galaxy’ was used for only the top models in Ford’s full-size range from 1959 to 1961. Its V8 engine is petrol driven and it has an automatic column shift transmission. We have a fleet of four modern hearses available. An icon of the Australian funeral industry, John Allison/Monkhouse’s horse-drawn hearse is famous for its involvement in many funeral services throughout Australia. This hearse is available for Geelong funerals upon request. Last Ride Funerals offer their services to Tuckers upon request.